The Friendship Mill Shaker Wooden Bedstead is a sturdy wooden bed frame that will suit a modern bedroom area and can be found by clicking on the red link. This bed has a simple and minimalist look and a timeless design that can be used for a long time. The wood is a warm antique fine which is made from a Scandinavian pine. The advantage of this Scandinavian pine is its sturdiness, since the wood has had a long/slow growing process in a cold climate. Depending on the size you are looking for, the bigger Friendship Mill Shaker Wooden Bedsteads have an extra central rail for support and a solid slatted base. 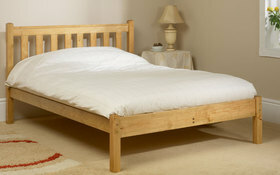 The friendship Mill Shaker Wooden Bedstead is very reasonable priced for its high quality and how it is built to last. Matress Online gives you several options on how you like to buy this bed: with a certain mattress, with drawers or on its own. You can add drawers to this bed which will only cost you 89.95 pounds for two drawers or 179.95 pounds for 4 drawers that will be placed under the bed. The bed can be delivered within just a few days without delivery costs. By purchasing a mattress to go on the friendship Mill Shaker Wooden Bedstead you can save money since this bed can come with a bodyshape memory mattress, which is a comfortable foam mattress. The Bodyshape memory mattress has a medium soft feel which is covered by a removable velour cover. The foam mattress has 5cm of premium memory foam and underneath this are layers of orthopaedic reflex foam. By purchasing this mattress with the bedstead you can save 25 pounds on the mattress. It is possible to get the friendship Mill Shaker Wooden Bedstead custome sized or in one of the default sizes which will have the following dimensions: a single with a width of 99.5cm (39inch), a small double of 130cm (51inch), a double of 145cm (57inch) and a kingsize of 160cm (63inch). The general dimensions of all the beds are: a head end with a height of 99cm (39inch) and a foot end with a height of 41cm (16inch). You can enjoy sleeping in this bed for a long time because of its quality and timeless design for a very reasonable price.